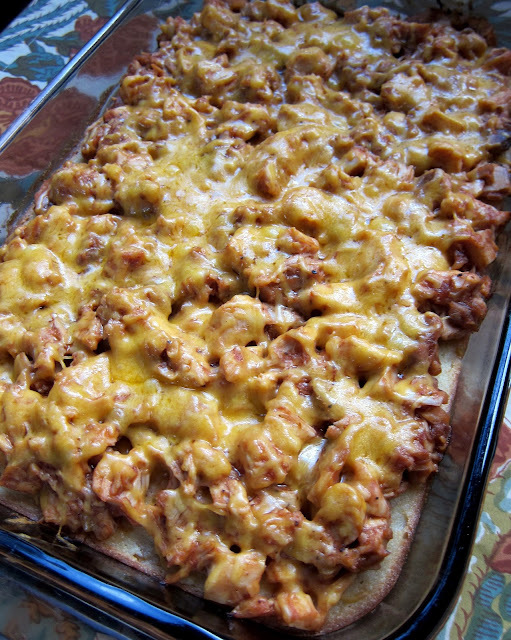 BBQ Chicken Cornbread Bake Recipe - cornbread casserole topped with bbq chicken and cheddar cheese - use a rotisserie chicken for a super quick meal. SO delicious!! 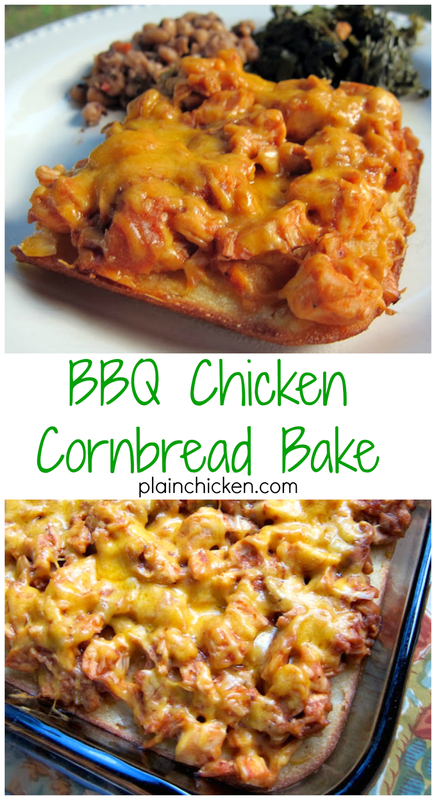 This BBQ Chicken Cornbread Bake was inspired by one of my favorite corn casserole dishes - scalloped corn. I tweaked the corn casserole and topped it with some BBQ chicken and cheese. All of my favorite things! YUM! It was so delicious! This dish came together in no time. I used a box of Glory Cornbread Mix and some rotisserie chicken. It takes longer for the oven to preheat than to prep this dish. I used Sweet Baby Ray's BBQ sauce because that is what was on sale at Publix last week. This was very filling and super delicious. It was even great reheated for lunch. Mix together corn, creamed corn, sour cream, cornbread mix and eggs. Pour into prepared pan. Bake 30 minutes. Toss chicken with BBQ sauce. Remove cornbread casserole from oven. Top with chicken mixture and top with 1 cup cheese. Bake an additional 10-15 minutes, until cheese is melted and cornbread is done. great creation Steph - looks gooey and delicious. You have been rockin my world lately with these casserole/bake dishes!!!! Keep it up!!!! A thought just came to me on this dish. We're still getting the Hatch chilies in now and I, of course, have several pounds frozen in my freezer. I'm thinking I am going to add some of those to this recipe to give a little nudge, maybe even some jalapenos for the heat but definitely the chilies!!! I am not a cook but tried my hand and my wife and I loved it. What's next? Fantastic! My brother loves that corn casserole, so I can't wait to share this recipe with his wife. Thanks so much! LOVE this concept. Instead of a protein and a side.....toss the protein ON the side!! Thank-you! I didn't have any sour cream so I substituted ranch dressing. It was absolutely delicious! Thank you so much for the recipe. Yes - that is what I used. Steph, what size cornbread mix did you use? I have the Jiffy mix that makes 6-8 muffins... Is that right? Thanks for all the terrific recipes! Used boneless chicken thighs seasoned with onion powder, garlic powder, chili powder and cumin. Layed 8 strip of bacon over the chicken and baked for 30 minutes. Cut chicken and bacon up and then followed the rest of the recipe. OMG delicious!